There are 12 families in Nadawa and they have been occupying the land for the past 50 years. 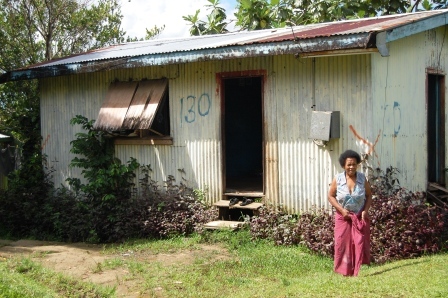 They have been squatters on land that is owned by the Nasinu Land Purchases Co-operative. Most of the church members who live here are low paid seasonal workers. Facing eviction, and the Church is their only support. The Diocesan of Polynesia are negotiating to purchase this 3.5 acres of land from the owners who are willing to sell it to the Church. In 2003, this land was valued at $80,000, so that price will have increased in value by now. The Diocesan has already set aside $36,400 and a further $20,000 is being pledged from the AMB for the purchase of this land. It is hoped that the government will make a contribution towards this cost as well. The proposal is the church will act as landlord and members will have guaranteed tenure. This certainty will enable the focus to move to developing a long-term sustainable community.